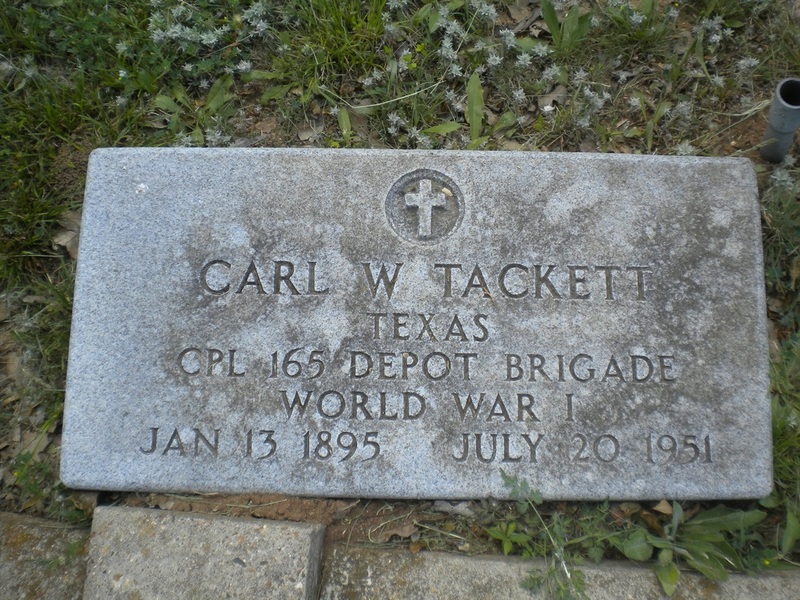 _Carl William Tackett was born in Parker County January 13, 1895, the son of William George Veal Tackett and Mattie Augusta Freeman. 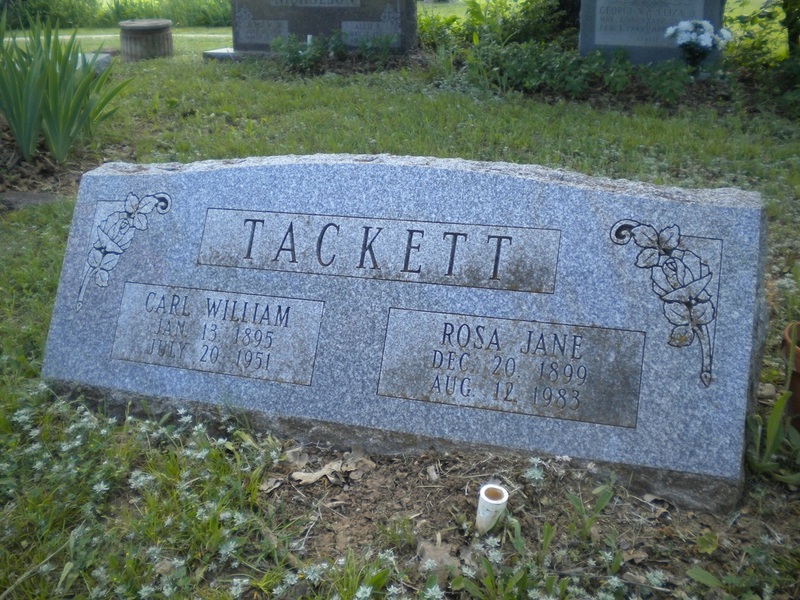 The Tackett family were early settlers in Parker County, Rev Pleasant Tackitt being the great grandfather. Mattie Augusta died when Carl was 2 years old leaving three children, Ida Nora and Carl. William George married Maude Alice Bagwell in 1897 and they had three children, Chester, Madge, and Duard. In the early 1900’s they moved to Bromide, Oklahoma. The three older children remained in Parker County. Rosa Jane Nicholson was born in Parker County on December 20, 2899, the daughter of George Nicholson and Eliza Jane Dobbs Nicholson. George came to Parker County from Tennessee when he was a teenager and Eliza was the daughter of William McGhee Dobbs and Olevia Green Dobbs. There was five of the Nicholson children, Annie, George, Rosa, Hood and Elton. 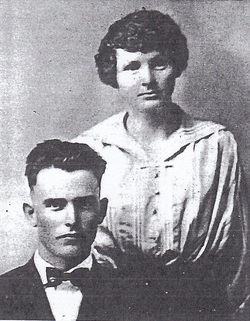 Carl and Rosa grew up north of Weatherford and attended school at Carter. They were married September 8, 1918 the day Carl returned home from army duty. In the army the name was misspelled with an e and has remained so through the years. The remained in Parker County most of their lives working as a mechanic and whatever jobs were available. They had four daughters, Anna Marie, 1919, Mattie Derenda, 1921, Willie Evelyn, 1926, and Elva Carcelle, 1935. Carl spent most of his life as a mechanic. Rosa was his handyman for running errands and she liked driving. If there was speed limits in those days one wouldn’t have known. Shifting gears wasn’t one of Rosa’s better traits – she would take off for downtown and Carl would holler “Rosa get off the clutch” knowing full well she couldn’t hear for she was half a block away. Those were the good years – depression was bad but their home was always open to our friends and relatives. Games were always close at hand and Mom still plays a mean game of 42. We lost Dad in July of 1951. Mom lives with Carcelle and Byron Golden in Georgia. Anna Marie Bergen lives in Spokane Washington. Evelyn and Lawrence Michou are in Anchorage, Alaska. Parker County is still Marvin and my home. I hope sometime along life’s way our Jerry will have such fond memories of his childhood as I have.